God has determined that the people who put their hope in Christ will be adopted as his children and will become Christlike. Before he created the world God chose Israel as the people who would live by the promises of God that would ultimately be fulfilled in Christ. God’s choice of the nation Israel as his “chosen people” seemed like an exclusive thing, like a closed circle. In fact Israel’s various rituals, sacrifices, and purity laws were almost guaranteed to exclude the other nations. But Ephesians is about a surprise: “You Gentiles were included when you heard of Christ and believed in him.” The circle is now open, the wall of separation is broken down, and it was God’s secret plan all along. Election refers to God’s act of choosing people to belong to him. In Ephesians chapter 1, Paul teaches that election is dynamic, open, and growing. Everyday people from unexpected places are coming into the light and life that Christ offers to us. There are cults in religion too. The word cult comes from the same Latin root that brings us culture and cultivate. The Romans cultivated both their fields and their gods. In religious studies the words “cultus, cultic, cult” refer to formal rituals or acts of worship. All religions have cultic aspects, in this sense of the word. Ritual movements, words, and the handling of sacred objects, among other things, make up the cultus of a religion. Practitioners of a religion believe they achieve some sort of contact with the divine, sacred, or transcendent during the enactment of the cult. Outsiders might call it magical thinking. In a catholic or orthodox liturgy the “cultic” elements (in the academic sense) are obvious: sacred vestments, incense, and the transformation of ordinary bread and wine into the body and blood of Christ. In pentecostal church services believers speak in heavenly languages and receive divine healing. In a baptist service lost sinners recite a sinner’s prayer and are born again, transformed forever by the power of God. When I was a student, back in the seventies, the word “cult” was being used in the sense of a new, unorthodox, and dangerous religion. The primary emphasis was on the deviant beliefs and practices of these religious cults. In the nineteenth century, several new religions emerged in America as the young country was expanding westward: Christian Science, the Watchtower Society of Jehovah’s Witnesses, various Mormon sects, and Seventh Day Adventists sprung up. These were groups that were usually considered cults back when I was a student. They had in common the complete rejection of traditional Christianity and new revelations and sources of authority. But in the 1970s and ’80s we began to become aware of newer religious cults, many of them splitting off not from Christianity but from Eastern religions. People became more concerned about the sociology of these groups than their theology. Cults became religious groups that exerted extreme control over their members. The greatest fear of parents of college-age students was that their kids would fall victim to a cult. The most gruesome example of the extreme social control practiced by cults was mass suicide of the followers of Jim Jones in Jonestown, Guyana. I came out a while back on Facebook and admitted to belonging to a cult. My kids suspected it almost twenty years ago when I started wearing lycra cycling shorts, which back then had a chamois pad made from real leather, by the way. When I built my new bike this summer and found a killer deal on the top-of-the-line, Campagnolo Super Record carbon crankset with ceramic ultimate level technology bearings that spin in Cronitecht steel races, I realized there was no need to hide it any more, no covering it up with black tape. I have joined the Campy Cult. I admit it’s a bit ridiculous for me to have elite racing equipment on my bike. Kind of like Danny DiVito thinking if he wears the same shoes as Michael Jordan he can beat him in a slam dunk contest. Bicycling Magazine in the current issue (December 2011) has a great article on the Campagnolo company, one of the last hold outs against the pressures of globalization. While everyone else is chasing cheap labor and outsourcing production to the far east, the family owned company continues to use highly skilled, well-paid craftsman in Vincenza, Italy. It used to be that nearly every rider in the Tour de France–always the winners– used Campagnolo components. But that changed with Lance Armstrong. Never faithful to the women in his life, he was steadfastly monogamous in his loyalty to his sponsors. Shimano parts worked well enough for him to win seven championships. 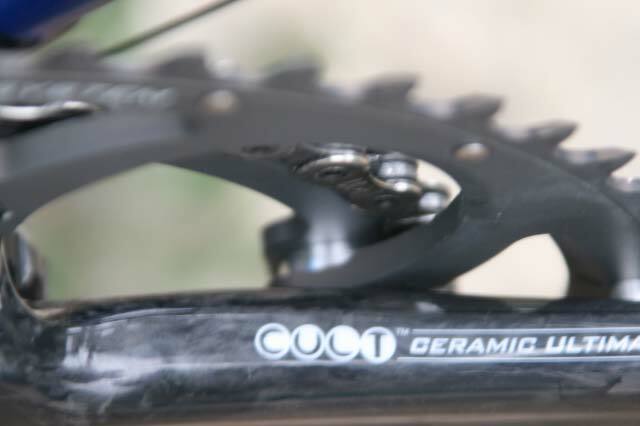 When Campy first came out with a ten-speed set of rear sprockets, Lance continued to win with only nine cogs in the rear and waited patiently for Shimano to introduce their own ten-speed cassette. We devotees of the classic Italian components concede that Lance was just that good–he was able to win on inferior equipment (with one gear tied behind his back, you might say). I’ll be back in a day or two with a report on the other cult I’m in danger of being drawn into . . .
Haiti needs bread, water, medicine, tents, now. Later they will need engineers, builders, construction crews, to build houses, clinics, and schools. The schools will need textbooks, including Bibles. I also think our first response should be to help now and then ask theological questions later. And realistically, the best way to help now is to send money to organizations that are already there on the ground. Questions of “why?” are easy to answer in terms of geology and physical science, politics, and economics–in terms of the divine purpose, they are harder. The question of “where” God was and is, is also easy to answer. God is present with the suffering people of Haiti, and he is present in the people who are there to help. Last week we hosted the Western Fellowship of Professors and Scholars in Manhattan, Kansas. We had a great time of fellowship and stimulating presentations and conversation. One of the highlights was a breakfast-conversation on suggestions for research in biblical studies, religious history, and history in general. Alan Bearman and Robert Linder, professors of history at Washburn University and Kansas Statue University suggested that there is an important place for amateur and local historians. Write the history of your local church! He also compared the work of a historian to that of a detective and a prosecuting attorney. Linder and Bearman also agreed that historians need to write readable prose. Witherington said NT studies is a multi-disciplinary field. He recommended learning methods of sociology and social science research, along with history, ancient rhetoric, linguistics, and ancient languages–Hebrew, Greek, Aramaic, and Syriac for starters. Witherington also gave a powerful address on worship at the plenary session Friday night. There were several great presentations (list here). Some of the papers have already been posted on the conference web page–others will follow. I was especially delighted that my former teacher, Dr. Lynn Gardner, was able to attend. He spoke on Postmodernism, the roots of which he traces back to Kant. To any of you who are troubled–either emotionally or intellectually–by the problem of suffering, I would recommend Dr. Gardner’s book on the subject. It’s hard to praise a book on such a difficult subject without sounding flippant–but What the Bible Says about Suffering is a very thoughtful and helpful book. Circle Oct 8-9 2010 on your calendar for next year’s conference; and Oct 7-8 for 2011. This year is the 500th anniversary of Jean Calvin’s birth. Most of the folks I associate with in theological circles have an important disagreement with the reformer–we believe that God ultimately intends salvation for all people. But sometimes I think one of the important contributions of Calvin is that he was willing to leave that the ultimate question of who will enjoy eternal life with God up to God. In the meantime, we can concentrate on doing what we know is God’s will on this earth here and now. That includes trying to establish peace and justice, building schools and hospitals, caring for the sick and poor. It certainly includes worshiping God, teaching his word, and proclaiming the Gospel. We can leave the ultimate results up to God and follow our daily responsibilities. The Christians were always different. Far from having cowed or confined its converts, their faith appeared to have liberated and relaxed them. There was a liveliness, a curiosity, an engagement with the world – a directness in their dealings with others – that seemed to be missing in traditional African life. They stood tall. Christianity, post-Reformation and post-Luther, with its teaching of a direct, personal, two-way link between the individual and God, unmediated by the collective, and unsubordinate to any other human being, smashes straight through the philosphical/spiritual framework I’ve just described. It offers something to hold on to to those anxious to cast off a crushing tribal groupthink. That is why and how it liberates. Princeton Theological Seminary has provided a site for reading through Calvin’s institutes in brief daily selections here. If you prefer to read the Institutes in the original French, Calvin 09 has the links. The site even has a Calvin Shop for those who think the Reformer needs to be comercialized. When my brother-in-law was about five he used to love telling a knock-knock joke: Knock-knock. Who’s there? Amos. Amos who? Amos bit me! I know plenty of folks who have the special talent “to mar a curious tale in telling it.” Many of us can sing a song out of tune and still somehow manage to get the words right. Theology is reflection on the meaning and content of our faith, it is scrutiny into the adequacy of the way we articulate our faith. Sometimes we explain it poorly. That doesn’t mean our faith is defective; it’s just like singing a tune out of tune. There’s nothing wrong with the song, but our singing of it is not very appealing. Theology is not only the business of professionals; all of us should examine the way we articulate our faith. Theology has three main tasks; the trick is keeping them in balance. The first task is to communicate the meaning of our faith to those who do not yet share it. To do this effectively we first have to understand the people with whom we wish to communicate. That means we have to be good listeners before we speak. Paul the apostle called it “becoming all things to all people.” Paul Tillich called it the method of correlation: trying to find the questions people are asking before we give our answers. Then we can try to express the good news in a way they can understand. The temptation is to package or market the gospel in a way that gives away too much, that compromises something essential. It is the temptation of trying to appease rather than challenge. The second task of theology is the ongoing work of reformation. Put bluntly this means recognizing that a lot of things we are doing are wrong and a lot of what we are saying is bunk. The followers of Christ are always like his first disciples, people of little faith, short-sighted, hard-headed, and slow to learn. The church is always in danger of corruption, and is always in need of renewal. So we have to continually go back to the sources and ask What are we missing? What are we getting wrong? What are we distorting. The third task of theology is conservative. We didn’t invent the faith; we inherited it and are entrusted with the mission of passing it on whole and intact. In trying to be relevant or trying to correct the faults of others, we risk losing something essential in the historic faith.